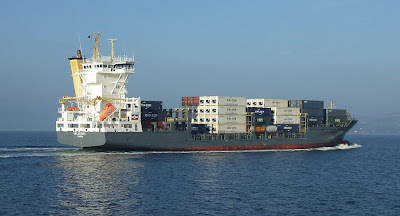 Running opposite MERIWA on the MacAndrews container service between Greenock, Dublin, Liverpool and Bilbao, VELAZQUEZ arrived this afternoon in pleasant sunshine. When she went on charter to MacAndrews in September 2005, VELAZQUEZ became the largest vessel that they had used to date on their UK/Iberian peninsula services. Much of her cargo is carried in refrigerated containers, these are the ones painted white in this view.